1. They are the least likely to be adopted. On Halloween, Thursday October 31st 10% of our sales will be adopted to Loup Garou rescue an organization devoted to the rescue and adoption of black cats and dogs! Halloween…my very favorite holiday of the year! Children dressed up as goblins and ghosts traveling door to door like scary salesmen, only they expect to be GIVEN something: a trick, or a TREAT! Treats are more popular these days, much to the chagrin of the parents whose little ones will be hopped up on sugar for days to come after the annual spookfest! While it’s all fun and frolic for humans, this particular holiday can be difficult for our pets, and most especially for black cats. Long associated with witches and evil, every year at this time, we hear the warnings: shelters won’t adopt out black or orange cats at this time of year, or “keep your felines confined to the indoors, lest they meet with a terrible fate.” There is a risk, to be sure, but more of a risk is that your cat might be met with mischief perpetrated by Halloween pranksters. But the incidence of cats being sacrificed to so-called Satanic ritual is less actuality and more urban myth. While there are some reported cases, there are more times when our sleek black beauties are the victim of rambunctious Halloween revelers. 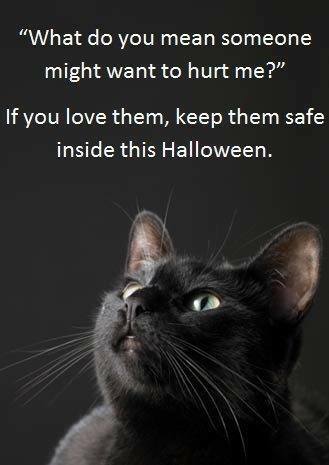 To be on the safe side, keep your kitty indoors. That way, the only peril he or she will face is the constant ringing of the doorbell as the Night of All Hallows is celebrated~! Are behavior modification drugs right for your cat? Do they really work? I’ve been asked how I feel about behavior modification drugs prescribed for cats. First, I must admit that I do partake in a little ‘nip on occasion. But that’s just for fun and the effect is short term. Shouldn’t we think very carefully before using drugs that could not only affect personality, but also have adverse side effects? Typical behavior problems include timidity/aggression, litter box avoidance, urine marking and compulsive behavior (e.g. excessive grooming leading to hair loss). How many cats live in the household? How many of these cats are exhibiting behavioral problems? Are litter boxes and private spaces sufficient and strategically placed? Sometimes cats just need a place of their own to chill out. Armed with this assessment the cat parent is better equipped to take Kitty to the vet for a complete physical. Cats generally hide their illnesses well, but if the environment hasn’t been altered a behavioral change may very well be due to some physical cause. If no physical problems are detected the first course of action should be to try a natural solution such as Feliway, calming music, or flower essences. Your veterinarian might also prescribe a food containing amino acids that reduce anxiety. (Please give any of these methods at least a month before making conclusions regarding their effectiveness.) However, if the problem(s) persist the next step would be a consultation with an expert in animal behavior. The veterinary specialist should visit your home to see Kitty’s behavior in her own environment. After exhausting all of the options above the veterinary behaviorist may want to try a prescription drug. There are four classes of medications that may be used depending on the problem behavior. As with human medications, positive results are not guaranteed and there are many potential side effects. Be sure you are aware of these and know what to do should they occur. Also ask if any foods are contraindicated while taking the medication. Oh, did I mention that these medications must be given daily? Is Kitty suffering from anxiety? Imagine how she will feel about taking a pill every day. (I know how I would feel about it!) However, many drugs are now available as flavored “treats” or in transdermal gels. This alleviates the stress for everyone, but consistency is vital. 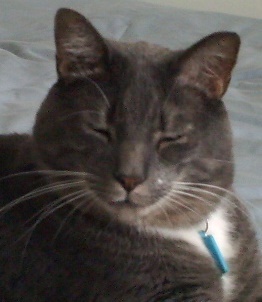 As a cat I think I can safely say that we would all prefer to “just say no to drugs”. However, if they must be used please keep us safe with regular veterinary checkups and blood tests as required. When using Anti Icky Poo urine cleaner, a black light is handy for finding places your cat has sprayed with urine or peed on. They are also helpful if you are considering buying a new home to find out if there are any urine stains. But they are not fail safe – they are not accurate on all surfaces. They are most accurate on smooth surfaces like a painted wall or very low pile carpet. They don’t reveal urine in kitty litter or on carpets with a deep pile. And you must use them in total darkness. After treatment with Anti-Icky-Poo will spots still fluoresce under UV / Blacklight? I understand this is not as important as removal of the smell / pheromones is the most important, but still I’m just wondering, especially in terms of being able to identify a ‘new’ spot vs on previously treated other than intensity of the fluorescing. Believe it or not, sometimes the dye you see is from the cat’s food! This week we also heard from another person who wondered if Anti Icky Poo is safe to use after her cat urinated in a house plant. It is totally safe – it won’t hurt the plant or taint the soil! As you said and it’s also on our website, smell is the way to know that the urine proteins and gases are gone. Further evidence is observing your cats – do they hover around those spots you treated? If not, then Anti Icky Poo was completely successful! As for knowing if those are old spots or new ones: You might keep a sheet a paper and list the locations and size of the stains you treated. If you use a black light every month or so this will help you know if the spots are old ones or new ones. Cat Faeries’ flower essences for cats and crystals on sale at 10% off! Get 10% off Golden Healer crystals and Cat Faeries’ own handcrafted flower essences for cats through November 1st. No coupon code required – the savings are right on the website. Cat Faeries’ flower essences for cats are professionally crafted for cats taking into consideration their collective consciousness and doing our best to get into the minds of our feline friends. 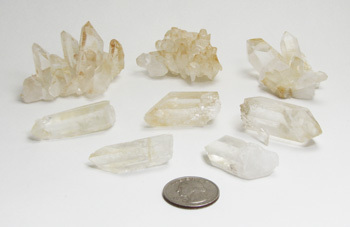 Our golden healer crystals are quartz crystals which grew near Iron Hydrate tinting them with varying shades of golden yellow to orange and thus amplifying their healing power. Even if it wasn’t nearly Halloween this article would still be creepy! And eye opening. And contains some interesting facts. It’s a mix of scary chemical science which in Cat Faeries’ opinion is corporations analyzing the likes and cravings of both people and cats then creating health sabotaging frankenfoods to seduce us into eating them. There are also many fascinating factoids. On page 2 you’ll learn about Pyrophosphates have been described as “cat crack.” On page 4 they explain the differences in how a cat eats from how a dog eats. On page 6 you’ll learn when animals hunt in the wild which parts of the prey a cat or dog goes for, and the nutritional value. Also on page 6 they discuss the origins of even our cravings for survival which is a mix of salt, sugar and fat – hence fast food addiction which plagues many people and is known as SAD (Standard American Diet). Animals’ taste systems are specialized for the niche they occupy in the environment. That includes us. As hunters and foragers of the dry savannah, our earliest forebears evolved a taste for important but scarce nutrients: salt and high-energy fats and sugars. That, in a nutshell, explains the widespread popularity of junk food. And the wide spreads in general—an attribute we now share with our pets. A recent veterinary survey found that more than 50 percent of dogs and cats are overweight or obese.